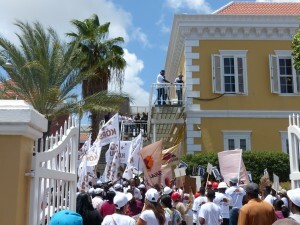 WILLEMSTAD - People in Curaçao go to the polls today for the second time in less than seven months to elect a new Parliament. It’s also the second time early elections take place on the island since new constitutional relations within the Dutch Kingdom took effect per 10-10-10, while it happened once in St. Maarten as well. This apparent lack of political stability as far as Curaçao is concerned to some degree goes back to the referendum in which a slim majority opted for the status of autonomous country negotiated with the Netherlands. The division between the various parties and their supporters on that issue at the time still exists. On the one hand are MAN, PAR and PNP wanting to maintain the present situation and work on improving it further with the Dutch Government. “Hustu,” which earned a seat in its first election last October, is also part of that group. On the other hand are MFK, KdNT – which earned three seats in also its first election – and PS seeking confrontation with The Hague and calling for independence. MP earned a seat in its first election last October as well and can be considered in that camp at least for now. However, there are also some candidate lists of so-called “new parties” without current representation in Parliament. With the election practically a choice between two blocks PIN, FOL/PAN and MKP could play a key role when it comes to “counting heads” in the legislature to form a coalition afterwards, as a single party getting more than half the seats is almost unthinkable. The elections are supervised by the Governor and outside observers from, among others, Caricom have been invited for well-known reasons, to ensure a free and fair vote. The democratic process taking place in an orderly and correct manner is most important of all.